A vacationing family travels to their remote ancestral home to celebrate Christmas, but when they begin to quarrel among themselves, opportunistic demons seize the chance to infiltrate the clan. It's up to the guardian spirit of the family's grandmother to save her feuding family from the terrorizing sinister forces. Philippines Tagalog movie. Shake,rattle and scream this Christmas!! 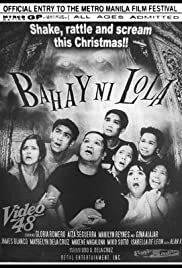 "Bahay ni Lola" starts slowly - and maintains that speed until the end. It's a rather boring horror movie with few chills, no action and only limited drama. It's not offensively bad, it just lacks anything that would interest in a movie. It feels very long, even though it only runs about 90 minutes.